Is Getting LeBron Worth Losing KawhI Leonard? Ok. We have LeBron, for the next few years. That's beautiful. But, if it means losing on Kawhi I's it worth it? I say no way. If it's true that Kawhi Leonard doesn't want to play for the Lakers because of LeBron James, the Lakers have made a huge mistake. He would be our next Kobe. I'm biased on LeBron because well, he was our worst nemesis. I'll be blunt. LeBron is old, Kawhi is young. I hope this is all a smokescreen, but if not, I'm not all in. 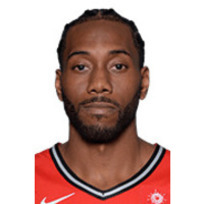 If we lose on Kawhi Leonard this year or next year, we have made a huge mistake. I hope Leonard is playing, but if he's for real, we have lost the best player since Kobe Bryant. Damn. I feel this is all a part of the game plan .. Lakers will stand ground .. will not offer the farm .. all the hype was KL interested in Lakers all this while .. not with King James here, KL is not interested is a smoke screen .. I am more interested to see how the young guys make strides forward this year .. if indeed that happens .. their trade value increases or they may be all keepers .. Lakers do not need to send everyone for KL .. I can't blame them though because losing KL is going to set them back for years to come. They won't even be the team they was before Tim Duncan arrived. Pop should do like Larry Bird did when he saw the writing on the wall for PG13 and that is leave before it happens. He's had a great run at it. I don't think it has anything to do with being "2nd fiddle". I think it's James specifically that he doesn't want to play with. Lol, haven't heard any of this coming from KL's people, most likely Spurs trying to get Lakers and other teams to bite on trading for him. Woj and most creditable guys have said if anything, James makes him want to go only to Lakers. Hope they wait for FA, I want to see what young guys can do 1st. Think BI is going to have a bigger jump in development than last year. More of this please, lol!!! I think Kawhi's people are the ones that have been putting everything out. Ramona said the guy who put this out there would actually know. He wouldn't make it up. Guess we'll find out, either I'm fine if we get him or if we don't. Although I do agree that they're some players out there that don't want to play with James, not so much about him as a player, more about circus that comes with him. Hearing Lillard is one of them. On another note, I bet LaMarcus Aldridge is sitting somewhere thinking what the hell is going on.....lmao. Glad he passed on us. Really? I hadn't heard that all. Interesting. Hmm, so Kyrie didn't want to play with James. Now Paul George and Kevin Durant have turned him down, and reports are that Kawhi and Lillard wouldn't want to join him either. Did something happen that we're not aware of? Or has the rest of the league caught on the the LeBron act and don't want any part of it? I'm sure seeing Kevin Love turn into a shell of himself didn't help lol. Coaches and teammates having panic attacks and shi*. Well maybe we'll get Melo! Maybe Lavar will suit up? Hmm, so Kyrie didn't want to play with James. Now Paul George and Kevin Durant have turned him down, and reports are that Kawhi and Lillard wouldn't want to join him either. Did something happen that we're not aware of? Or has the rest of the league caught on the the LeBron act and don't want any part of it? I'm sure seeing Kevin Love turn into a shell of himself didn't help lol. Coaches and teammates having panic attacks and shi*. Well maybe we'll get Melo! Maybe Lavar will suit up? I'll give you one of them in Kyrie, but PG13 was pissed at lakers for not trading for him last year, sure his agent probably had something to do with that !! And why the Hell would KD leave best team in NBA, I'd would have questioned him if he did. And those Kawhi reports are BS, every day it's something new, earlier today he was going to Toronto, couple of days ago he'd resign with Sixers. Good to put rumors out there if you're trying to get teams to up offers. Like I said, different story every day. You'll give me one? I didn't report any of these. You can assume what you want, I'm pointing out that George turned down the opportunity to come here and play with him. Then reports said Kawhi & Durant don't want to. That Kawhi report is very believable. Guy that covers the Spurs was saying both Kawhi's people told him that AND the Spurs confirmed it to him. YOU are the one letting us know about Lillard. And obviously Irving if accurate. Did George turn down Lebron or did George make his decision first? Was money an option...YES. Did you watch that BS docudrama from Paul George...did you see his agent was pushing the financial component there? You're not paying attention to what I'm saying. Did he have an opportunity to come play in LA with James? Did he take that opportunity? That's exactly what I said. Hell no, I didn't watch that BS. As soon as it was announced I said he wasn't coming here. The guy that first reported it, Shams, is not a Spurs guy. He's like the new Woj. Oh I see...A double hypothetical. Did PG make a decision to wait for Lebron to make his decision before he made his? Or did PG sign with the Lakers in hopes of Lebron James signed later. Furthermore, if you knew he wasn't coming when you saw/heard of the BS documentary, then you are essentially suggesting that the decision already had been made. I do believe the taping was in May and June, so his decision was already made. Consequently, is your question is whether PG made the decision for his life, did a filming, and refused to reconsider his choice after he came to the realization that LJ may decide to come to LA? I'm sorry I must be confused, bc I though the point of the discussion was that players didn't want to play with LJ? Was it they didn't want to play in Cleveland? Wade & Bosh didn't want to play in Cleveland. But Miami was another story, but I don't think Paul George knew one way or the other until LJ announced about LA. Also I'll trust someone who knows Kawhi and his uncle personally. It's not about James, sorry!!! It's about LA, he wants to be in LA, doesn't matter with who. But have a question for you JJ and anybody else, seeing what Kawhi can do when he's not happy, and knowing he wants to play in LA, doesn't matter what team. Would you trade for him and risk losing him in FA if he's not happy again, or would you take a chance and wait till FA, and go up against Jerry West in recruiting him ??? Kyrie - You are correct, he didn't want to play with Lebron. Durrant - He is already on the best team and making 30 million, why would he leave GSW. Lillard - He is currently signed with Portland, why would he ever say anything different then he wants to stay in Portland. George - Made his decision before he knew where Lebron was going. He feel in love with OKC and what top 20 player wants to play with 3 teams in 3 years. Kwahi - There are rumors going both ways, that he does want to play with Lebron and that he doesn't. You are just believing one side to make your point. Next summer we really truly see if other all stars want to play with lebron. Because this summer there was only 1 FA all star that could have came here and that was PG13, who picked OKC before Lebron picked us. You guys are taking this way too serious. I'm not making a point really. Just sayin it's interesting that there are all these reports that these different stars don't want to play with James. And I highly doubt he planned to come here and recruit Stephenson and Rondo lol. I don't believe that. And as far as George not waiting for James' decision, I think it's fair to assume that James talked him at some point prior to his decision. Just saying. Personally I think it's madness to trade for him. Yes the young players may not amount to anything but you can get him in free agency if he really wants to come here. Yes it didn't work with PG13 but that's the chance you take. Just as OKC took the chance of a 1 year rental. Sometimes you win sometimes you don't. It's having a plan B, C and D in anticipation of what may happen. I am still skeptical of the FO having one. Rondo takes development minutes away from Ball and KCP takes them from Ingram and Hart for example. This is where every one is going to say the youth need veteran help. No, they need good coaching and reps in games. What can Rondo offer Ball that Magic can't, or Brian Shaw etc. Disagree about Rondo, like that signing, think he'll be a good insurance policy if Zo gets hurt again, as I've said before, not a big believer in players can't develop with less minutes or off bench. Besides the fact that I want the best player on court that gives team best chance to win , Be that Rondo or Zo. Anyone else worried about Leonard maybe being injury prone? I was wrong about Bynum and so I'm nervous about any players who miss a lot of games due to injury. Rondo signing made most sense out of the three guys we signed. Ball’s injury details are quite murky and I fear he might miss significant amount of games again this season. Plus I like the fact that he would have to fight it out for the starting role. This would also force Lavar to tone down some of his patented antics. Lol. The practices are going to get really interesting. Just practicing against Rondo now will elevate his game to a different level. Rondo is no punk , he competes at all times, he’s tenacious on D, he will make Ball’s life hell in practice . And that’s just the physical part - Rondo will also benefit him with the mental part of the game as well. I wished we could've gotten him last year but hey, we got him now. I think this team will have more chemistry than the naysayers realize. Where do you see Rondo next year? Zo was drafted to be the leader of the team, magics words not mine, so if he isn't the future then it was a wasted pick. Unless he shows something different this year regarding his shot then they are going to get cents on the dollar in any trades. Not saying Rondo isn't a good player, but he is basically the same skill set as Ball. You don't buy all the versions of the latest iPhone because you can't decide which one you want lol. It can quite easily go the other way with how the Lakers did Lonzo dirty, and not giving him a chance etc etc. The young players deserve a chance I just think signing vets takes away some of those chances. His D has taken a dip and I'd rather his minutes went to Hart who deserves minutes or KCP to actually spread the floor. We will see how it plays out but I don't like the composition of the roster. He’s getting a chance....just not getting it on a platter. I’m not going to bust the fo’s Kahunas just yet. Rondo has already made it clear he wants to pursue coaching once he retires. This is a perfect project for him and Zo should be excited to work with him. Based on what is on the market and our cap space, we can sign anyone HOWEVER, not everyone is willing to do a pay cut or do a 1-year deal with us for a discount. Thus, given the players that are available and willling to join us. I’d take it since it is still better than having Sacre, Kelly and Ellington as our starter. This is a major improvement without compromising our flexibility to improve. With or without Kawhi, our team is already good enough to compete in the west. it is rather odd that people usually overlook the young core, they have improved a lot. We are far more dangerous because we have on our side the element of surprise! Like I said, time will tell with him. He wasn't exactly a great presence with the Mavs and Bulls. I agree and that was the only issue I had with him in the past. Hopefully he turns that around and gives us the pelicans Rondo. Fingers crossed. Lol. I think Rondo will be great. Like many NBA analysts have suggested, Rondo plays to his full potential when he plays for or along side great coaches and players he respects (i.e. Garnett, Pierce, AD, Gentry, Doc, etc.). I think Rondo will have the same mentality playing along side a HOFer like Lebron. Rick Carlisle isn't a great coach? Dirk isn't a HOF? Jimmy Butler? Wade? He hasn't been the same player since his Boston days. Sure he has some great games but he is far from consistent. Would love to be wrong about it all I just think he is the wrong player at the wrong time. I think the respect factor is the main thing along with being on par with his expectations in terms of basketball ability, IQ, and effort. Still a character flaw but if they can figure him out I think the ends will justify the means. With a vocal leader like Lebron James who holds people accountable, I think that will be great for a guy like Rondo much like KG on the Celtics. Just my guess, the guy is still a wild card. My perception is mainly based on the things that were said about him by his former Celtics teammates on Area-21 and other shows. I'm just glad we didn't lose our core....PERIOD. We can go after KL and others next season. Quick Reply: RE: Is Getting LeBron Worth Losing KawhI Leonard? Does GS Losing Sour the Walton Hiring to You?